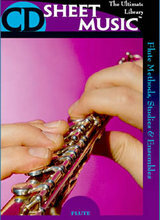 This collection makes available fourteen essential flute methods, studies and exercises, as well as over 150 works for flute duos, trios and quartets by over 30 composers from the 18th and 19th centuries. This collection makes available a wealth of music for solo clarinet including sonatas, concertos, and solo works by 28 composers from the 18th, 19th and early 20th centuries. Also included are two complete volumes of collected works: Easy Duets and Album of Short Solos by Various Composers. Scores and parts are included for many ensemble works. This collection makes available eight essential clarinet methods, studies and exercises, as well as over 30 works for clarinet with instruments including duos, trios and quartets by 20 familiar and lesser-known composers from the 18th, 19th and early 20th centuries. Scores and parts are included for many ensemble works.